Sometimes being on social media makes me feel like I am back in high school. That is not good. I found high school to be like a four-year dental appointment. And I was considered “popular,” whatever that means. I can’t imagine the pain if you were a nerd. “Like” me is now the unembarrassed beg on Facebook. Was your post “shared”? How many “friends” do you have? Dear lord, not that again. But still, I engage. I’d love to blame it all on being a writer just following Jane Friedman’s latest advice (which is right on), but the truth is I get sucked into the vortex. I want to play with the big kids, be part of the fun, and sell a few books along the way. I’ve trying “getting in” with the other crowd, you know, those Twitter folks, but so far they’re not sure about me. I’ll keep trying, though. Okay, I’ll admit it. I can actually have fun on Facebook. It’s just short of miraculous to be reconnected with people I haven’t seen or heard from in years. I love seeing photos of new babies, weddings, and puppies. Celebrating new books is like an online party. Sharing joyful news is a huge draw to social media, but so is the ability to talk about sad events and loss. A new community has been born. How can that be bad? Enter the inevitable meanies. Remember the girl who was sitting at the popular table in the cafeteria, whispering into the ear of the prom queen while pointing at your knee socks and laughing? I’d love to hear what the guy-version of this is, because I’m sure it exists. Anyway, the meanies are back, alive, and have infiltrated social media. Witness one poor woman who made the mistake of warning her fellow town-folk on Facebook about the price of a fish platter at a local restaurant if you customize your combo order. She went from being anti-the-restaurant to anti-commerce to anti-American in twenty comments. The vitriol in the remarks was so over the top, I winced reading them. Her reaction was to recoil, explaining she was only trying to help people avoid the same experience. Don’t even start me on the nastiness about the political scene. I wish I could say it’s limited to my “friends” on the right, but some of the most condescending disdainful posts I read recently actually were delivered by those I consider political allies. 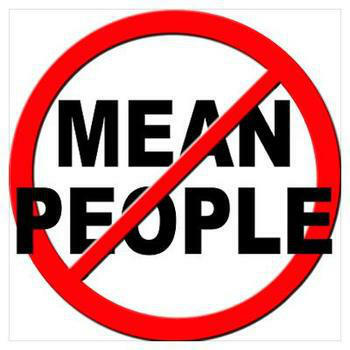 Can’t we disagree without becoming mean and personal? As a lawyer, I have long mourned the loss of civility in my profession. We have lost the art of advocacy without evisceration. Social media is rapidly becoming no less contentious, I fear. One person “unfriended” me when she learned I was a divorce lawyer. For that reason only. Ouch. Come on! Why can’t we all just get along? I’ll defend your right to say what you want to the mat, but can’t you say it without trying to bully others into silence? I didn’t have the guts not to be mean in high school and for that, I am sorry. I’ll be damned if social media makes me repeat my mistake.